Sri Lanka’s Central Bank is currently working towards breaking the trend of the country’s economic agenda being hijacked by electionsor other such political developments, by making an attempt to institutionalize the various frameworks for macroeconomic policy formulation. Central Bank Governor Dr.Indrajit Coormaraswamy said they are pushing for amendmentstothe Fiscal Management (Responsibility) Act, which was introduced in 2003, to strengthen the legislation and give it “some teeth”, so that the influence political developments such as elections will have on the country’s fiscal policy will be limited. The government yesterday announced its plans to hold the long-delayed Local Government polls in January next year. “Sri Lanka has a Fiscal Management (Responsibility) Act and it has certain targets in it. But it has absolutely no teeth. It was introduced in 2002 or 2003 and it has been probably breached in the subsequent years more times than not,” Dr. Coomaraswamy told a seminar organized by the Shippers’ Academy titled ‘State of the Economy’ in Colombo, yesterday. The Governor said the Act should clearly indentify the specific reasons why the targets set in it can be breached and the subsequent measures the government will employ to achieve those targets. “So the idea is to strengthen the Act and give it some teeth by indentifying the specific reasons as to why the targets can be breached—natural disaster, floods etc. And if you breach, you have to set out a clear path as to how you are going to achieve those targets in the future. 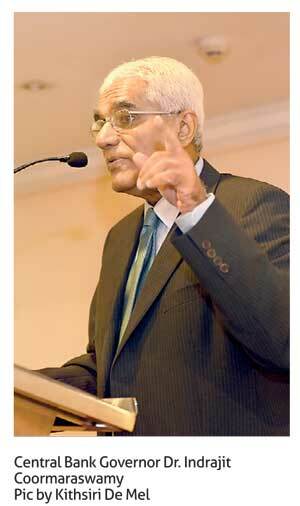 This is really an attempt to put sand in the wheels,” Dr. Coomaraswamy said. He said the Central Bank has been able to convince the Prime Minister’s economic team on several occasions in this regard. About two weeks back Sri Lanka reached a staff-level agreement on the third review of the ongoing Extended Fund Facility (EEF) with the International Monetary Fund by successfully fulfilling all the conditions set out by the multilateral lender. Although the EEF is for just US $ 1.5 billion, to be disbursed within a period of three years, a successful programme is considered a seal for ‘good housekeeping,’ specially for countries like Sri Lanka, who may have to raise a lot of money from international markets in the future to service their outstanding debt. Sri Lanka’s fiscal front during the last year or so has seen considerable improvement with the government embarking on a revenue enhancement-led fiscal consolidation programme, which anticipates the budget deficit to come down to 3.5 percent of the Gross Domestic Product (GDP). Hike in Value Added Tax (VAT) and the passage of the new Inland Revenue Act were major milestones in this pursuit. In addition, the government is employing strong tax administration measures with plans in the pipeline to come up with tax identification numbers and to have tax files for everybody over 18 years old. Dr.Coomaraswamy said he is “cautiously optimistic” about the stabilization of the economy although the country’s debt dynamics remain tricky. Meanwhile, on the monetary policy side, the Central Bank is in the process of introducing a flexible inflation targeting regime. Up until recently the Central Bank had targeted monetary aggregates. Governor Coomraswamy said the Central Bank is also in the process of putting a legal and accountable framework to support the inflation targeting regime like several other countries. He cited New Zealand as an extreme example where the Central Bank Governor has to resign if the inflation target is missed. He also said the Central Bank is working closely with the technical exports at the IMF in creating a clear framework for exchange rate management. However, he didn’t elaborate much on it as it hasn’t so far been finalized.